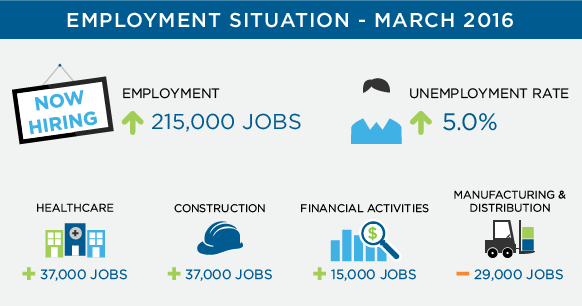 The March jobs report showed employment growth remains strong. The U.S. Bureau of Labor Statistics (BLS) showed employment increased by 215,000 jobs, a decrease from February’s revised increase of 245,000. The unemployment rate was little changed at 5.0%, a slight increase from February’s unemployment rate of 4.9%. In March, healthcare employment added 37,000 jobs, construction increased by 37,000 jobs, financial activities added 15,000, and manufacturing decreased by 29,000 jobs. Average hourly earnings increased by 7 cents in March, to $25.43, following a 2-cent decline in the month prior. Over the year, average hourly earnings have risen by 2.3%. Healthcare employment increased by 37,000 jobs in March, with 10,000 of the job gains occurring in hospitals. Over the year, healthcare employment has increased by 503,000 jobs. Kristin Carpenter, Director of Operations in San Diego, commented on the increase in the healthcare industry, "We have seen a drastic increase in available contingent and permanent employment opportunities with our clients over the past month. It is evident that it is a candidate driven market and candidates are receiving multiple offers shortly after they initiate their job search. Eastridge remains focused on successfully managing expectations and pushing to understand a client’s needs from the start. When filling a position, we look to make a strong skills match and a good culture fit for our clients. In return, candidates are expected to hear back in a timely manner. We are recommending that clients provide us with interview time slots up front and allow us to quickly move into the scheduling process. This method is more effective in keeping top candidates engaged throughout a shorter hiring process and results in a positive candidate experience and more favorable reputation for our clients." Miriam Romero, Account Manager of the Healthcare Division in Las Vegas, noticed an increase in all positions across the board. "We have had staff requests from large healthcare groups for their specialty clinics and have seen an increase in staffing needs in radiology departments." We have also seen an increased demand for phlebotomists, so our recruitment efforts have intensified in this area in the last month. Construction employment rose by 37,000 in March, with a gain of 12,000 in residential specialty trade contractors and a gain of 11,000 in heavy and civil engineering construction. Over the year, construction has added 301,000 jobs. James Logue, Area Vice President of the Construction Division in Texas, commented on the increase, "In Texas, we are seeing many projects start with new commercial buildings, condominiums, and apartments. This has led to a high demand for qualified skilled trades people. To maintain a robust database, Eastridge’s Construction Division interviews an average of 180 candidates weekly for labor and skilled trades. Since our worker database is updated in real-time, we fill 97% of contingent requisitions within 24 hours. Employment in financial activities added 15,000 jobs in March. Evan Levine, Executive Recruiter of the Finance & Accounting Division in San Diego, commented, "The increase in jobs in finance and accounting has equal impact on employers and job seekers but in different ways. For employers, 15,000 new jobs in one month means that there is more competition for top-talent. For active candidates, this increase combined with low unemployment means there is less competition." Employment in manufacturing declined by 29,000 jobs in March, which has been the biggest one-month loss for the manufacturing sector since 2009. Laura LaManna, Area Manager of the Manufacturing & Distribution Division in San Diego, commented, "While there was a national decline in manufacturing employment nationally, the San Diego market for Manufacturing and Distribution saw a dramatic tightening in the candidate pool during March." Jack Gaber, Operations Manager of the Manufacturing & Distribution Division in Las Vegas agrees. "We continue to see an increase in demand with our clients in the Las Vegas market." "Clients rely on Eastridge because they find it has been too difficult to find candidates on their own who have the skillset and background that the company is seeking. Many companies have increased the pay by as much as one dollar per hour for great talent as they feel that the market for skilled and semi-skilled workers is shrinking." The unemployment rate rose to 5.0% in March, the first month-over-month increase since May 2015, largely in part as more people are joining the labor force. It is more crucial than ever that employers implement a strategic talent acquisition strategy. From developing more concise and effective interview processes to innovating new ways to brand company culture, companies must realize the significance in engaging with today’s top talent. To find out what gaps exist in current hiring processes, see the results from Eastridge’s Talent Acquisition Assessment. Stay competitive in the marketplace to attract the best talent. Partner with Eastridge Workforce Solutions to evaluate headcounts, gear up for peak seasons, and hire top talent. Contact us today to see how we can help you stay ahead.